He quietly sipped the cup of warm coftea that instantly made his pallet cringe and buckle under the barrage of sensations bombarding his thoughts. The long flames of the sun licked the inside of the observation room creating life and death in its own dramatic circular cues of shadow and light. Perplexed the Wormhole Engineer and Drifter Analyst walked back to his polished obsidian desk made of Sleeper wreckage that his secret society contacts had paid a large amount of ISK for. He sat down at the desk thinking of it as being a living a machine and thought. "The Drifters must be using a Remote Calibration Device to be able to access New Eden Space while Capsuleer's are not able to enter the wormhole at the Unidentified Wormhole beacons that are seeded across New Eden space. There has to be a method to their madness. " he typed into his log. He took another sip of the now somewhat cooler coftea, cringed at the even more distinct bombardment and continued typing. "Capsuleer's have discovered new areas of Sleeper Space called Cache that when hacked opens a rift to other hidden locations called Backline's. Drifters must be using the same technology on the backside of their wormhole generators that can only be accessed from Drifter Space which must be separate from Sleeper Space altogether." He scrolled through numerous technical readouts until he came across what he thought might be the next conduit in the Drifter's network. "Remote Calibration Device." he said to himself looking out through the large observation port at the fleet of ships forming into an uneasy alignment for someplace else. "The Remote Calibration Device has two settings, Low Power and High Power that requires an input of the Z, X and Y coordinate. X,Y and Z determines a start point end point and reference point in 3D dimensional space-time. But if a rift is not normal space-time then the rift itself must have its own point of reference within the axial coordinate values. A value that the Circadian and Autothysian Lancer must be searching for. These two class of Sleeper's search everything. But nothing of value is ever taken." He paused and smiled to himself as the humble ding of the wooden clock brought with his ancestors from Earth played with the fire of the sun dancing inside of the observation room. "...but nothing of value is ever taken...nothing of value. An axis inside of a rift that is separate of normal space-time or the normal X,Y,Z dimensional values where even Sleeper Space is nothing of value. It has no value yet it exists thus giving it value. A non-existent value that exists within a value. A fourth and fifth dimensional coordinate? Possibly." He stood up and stretched and looked at the clock on the wall. It had only been thirty minutes since he had started but it seemed to have been like he had been lost in time for ages. The analyst walked over to the clock on the wall and listened to the slight metallic ticking in his ears. How could the Sleepers and Drifters create space within space-time without coordinates. He thought for a while and then remembered his grandpa had taught him while on vacation. 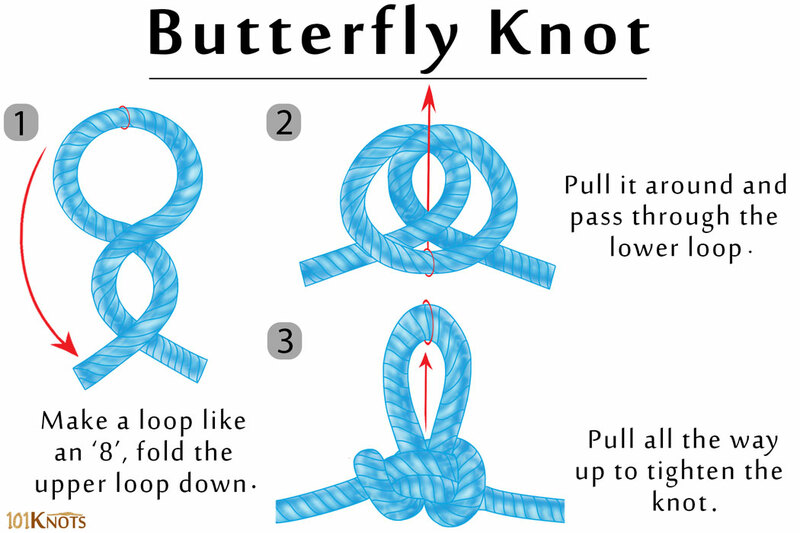 "A Butterfly Knot." he said allowed. He hurried back to his computer and continued typing. "A butterfly knot has three points of reference in its construction which would represent the normal space values of X,Y and Z." he typed bringing a second display of the nearly 50,000 year old knot typing method. "Make a loop of space-time at the very base of the atomic interaction that cause nearly any gravity to be present. The top loop would be bound to the bottom loop as the two Cold Atom Generators created a conduit in the shape of the number 8. Normal space-time would flow all around the loops but not within the conduit loops themselves which would be separate of space time and therefore not have a value but would still exist as the atoms although not being able to be detected because of their nearly non-existent energy would still exist." He manipulated the strand of rope on his screen into cold atoms and began to see how it might be possible for the Sleepers and Drifters to exist in a no value space-time environment. He finally saw it for the first time and can to understand how Sleeper's and Drifters created their own space-time.
" Within each center of the loop or the figure 8 normal space-time is trapped as it cannot escape past the barrier created by the Cold Atom Generators as there would not be any interactions possible that would allow the atoms within each loop to react with. Axis X would be the first coordinate value in creating space-time within space-time. Much like our own Universe that has a detectable edge that our scans cannot penetrate must be how W-Space and B-Space ( Backline Space), is created." He pressed a button on the desk and the spot under the coftea began to glow a soothing light blue color and the disappeared as the warmth returned to his drink and his thought. "The X-axis would create two different regions of confined space-time." Taking a sip of the coftea and shaking his head he continued. "The top loop is then pulled down over the bottom loop creating a pretzel affect that now has four different locations of space-time within the Butterfly Loop for the Sleepers and Drifters to exist in or the Z coordinate. The size of their Cold Atom Generators must be enormous to be able to effect so much space-time. Enough space to trap entire solar systems in and keep them hidden." The clock dinged again its 4:50 am assertion of precision. "The second construct would be the Y-axis with multiple points along the cold atom conduit being used to accessed each sector. Conduits that are constantly moving around their space to create an infinite number of entry and exit points that only the Sleeper and Drifters would be able control. A conduit that would allow instant travel to their space-time but would not effect normal space-time but could only be detected when the wormholes are generated which could be due to the constantly shifting of cold atoms from being active to nearly inactive by the Cold Atom Generators." He paused for a moment as ding sounded an incoming message. "So." he arrogantly sipped his coftea and continued. "The rifts created by the Remote Calibration Device must located located in the conduits themselves as the lower loop of the knot is pulled through the upper loop to cause loop entanglement as the loops would create ad infinitum so that entrance into the Backline sectors were guarded precisely. So precisely that tractor beams would need to be used to exert a force on the cold atoms to very slightly modulate the movements of the cold atoms to allow for travel to a Backline sector or system." Thoughts raced his mind as he tried to slow the computations taking place within his thoughts...or possibly the desk's thoughts. Y coordinate value that when all of the three coordinates were aligned properly the large amount of space contained within the region could be accessed from numerous points along the conduit but only if the proper X, Y and Z values were inserted into the Remote Calibration Device that would receive it's telemetry through various readings taken from the tractor beam generators that locked onto cold atoms within the conduits as only a slight amount of mass is needed for a tractor beam to tractor." The cold atom within the conduit would therefore be considered to be the J-axis because it does not have a value in normal space time but has an ad infinitum value as it would never destabilize like a normal atom would. Instead the cold atom would exist at a rate of over and over again thus giving Sleeper technology an infinite number of points to lock onto." He stopped to ponder another thought while filling up his mug with Quafe this time. "If the Sleeper and Drifter are able to control Rift Space and their own space so precisely to the point of being able to trap normal space within space-time itself. Then why do they need to create artificial wormholes when they could travel via the naturally occurring wormholes?" He sat back down at the desk and leaned back in his chair watching an early morning shipment being brought to the station via Mammoths, Iterons, Sigals and a few Badgers.
" It must be the weekly shipment of ore or minerals from the mining colony around Moon VIII. " he thought to himself quietly. "That can'e be right." he exclaimed loudly in the still darkened observation room as the shadows of the hauler fleet played against the interior of the sanctuary. "The artificial wormholes created by both species has to be a direct access to central Drifter operational command centers that would not be accessible to the Capsuleer even while in W-Space. A Backline to the Backline sectors discovered in Rift Space. A possible set of cold atom filaments not entangled with W-Space conduits? Maybe even the possibility of the Drifters and their Sleepers having the ability to generate inter-connecting links between Drifter Space and W-Space using cold atom generators to modulate a small conduit that collapses after a certain amount of time to cover their their tracks and presence. " Digging deep into his memory he looked for the correct theoretical formula. "For every action there is an equal and opposite reaction. That would make sense then why natural wormholes appear randomly. " he typed into the log. "When the Drifters use the Forwarders it must generate a lot of waste energy in the conversion process that much like the ancient car engine would need a tailpipe to expend the used energy so too would the Forwarders." he input a series of commands into the graphic generator as the light from the monitor played across his face creating an eerie light blue color. "The waste energy must travel through the cold atom conduit and at a time designated by the Sleeper or Drifter the cold atom generators increase bend or stretch the cold atoms in a localized section of the conduit that then creates the seemingly stable wormhole. Mass reduces the size the of the wormhole when artificially applied as well as naturally over several hours. " "Mass is only present in atoms that are active." he ran a few thought calculations and continued. " Mass in the presence of an atom with the potential for mass but does not have mass could become slightly active in the presence of the mass placed against it that would could slowly make the cold atoms become active over a period of time and eventually active to the point of becoming normal atoms that would return the effected space back to normal K-Space.Basically as the ship is passing through the wormhole it is occupying cold atom space and applies a force against the atoms that in turn generates kinetic and thermal energy." A tone sounded on his computer that brought up the holo-image of a very seductive short black haired woman. "Not today, thank you. I have already had my Remediation for the week." he replied taking a deep drink of Quafe. He ended the message with a sigh "Babbles." "The Sleeper Forwarder must balance the mass passing through it somehow. Maybe even possibly converting the mass that passes through it's wormhole into usable energy that it transfers along the conduit to other Forwarders. But why won't the Sleepers or Drifters use the natural wormhole created as expended energy? They must know that it exists as they created the cold atom conduit and would monitor it's shell for any fractures that would an intruder to gain access to their territory." He shifted in his chair and re-adjusted the cushion inflation. "Ah, that's better." he said. "Perhaps the Sleeper Preservation Conduit is part of the Forwarder network that pulses every few seconds to transfer the waste energy through the conduit to a location far away from the artificial wormhole generated by the Forwarders." "The Eve Gate that collapsed and trapped our ancestors here was a naturally created wormhole. " he worked back through his log for several moments and pondered the unimaginable. "It takes numerous Capsuleer's hacking on each side of Drifter Structures inside Unidentified Wormholes in order to access the central location. What would happen if all of these sites were hacked in the same manner at precisely the same time? Could the greatest hack in New Eden history open a portal to another Universe out of our own?" He entered into his log as an uneasy sensation came over him. "Could all of the dual side hack sites be a large system of Forwarders that created the Eve Gate as expended energy when the Drifters and Sleepers first brought their systems online after detecting the first human presence in New Eden and then collapsed the Eve Gate in order to keep the menace of humanity from ever finding out about them, hoping to starve them death?" The thoughts of the analyst drifted away for a moment as placed his hand on the Sleeper Desk. "We're they merely trying to access another Universe across space-time and didn't realize that humans had found their sanctuary but once they found out about humanity the Drifters enacted a state of war against the Amarr Empire eventually killing their empress?" "But why the Amarrian Empress?" he thought deeply into Earth's past and drew a blank. Shaking his head and taking a sip of Quafe he returned to his own thoughts. "If everything that I have written in my log is correct then the Drifters and Sleepers have the ability to generate wormholes where ever they want to. If New Eden was able to capture all of the duel hack sites and learn how to pinpoint exact coordinates within normal space-time then perhaps a wormhole could be created that would provide us with a means to return to Earth." Being at the end of his day he drank the last bit of his Quafe entered a few variable into the computer and pressed the compile button. "Computer, begin reverse engineering of the Remote Calibration Device using my log entries and the data from the Seeker Libraries." A beep sounded as the computer complied and began compiling the massive amount of data requested that was stored deep within the stations protected data vaults. "Computer, what is the expected time of data compilation?" A few moments passed without a response. "Computer, are you running the compilation I asked you too run?" he asked rather angrily of the machine. The computer readout on the screen simply returned a "Yes." "Appended, Doctor." the computers voice finally replied. "...but nothing of value is ever taken...nothing of value......It has no value yet it exists thus giving it value....... A non-existent value that exists within a value......A fourth and fifth dimensional coordinate? Possibly." The analyst turned away from the computer and walked towards his quarters the thought stuck in his mind of the non-existent, existent value. He turned one last time and looked at the computer screen readout. "Possibly." the computer screen replied. I'm out in Etherium Reach conducting research on Rogue Drones and came across a Hierarchy combat site, one of the rarest Rogue Drone sites. 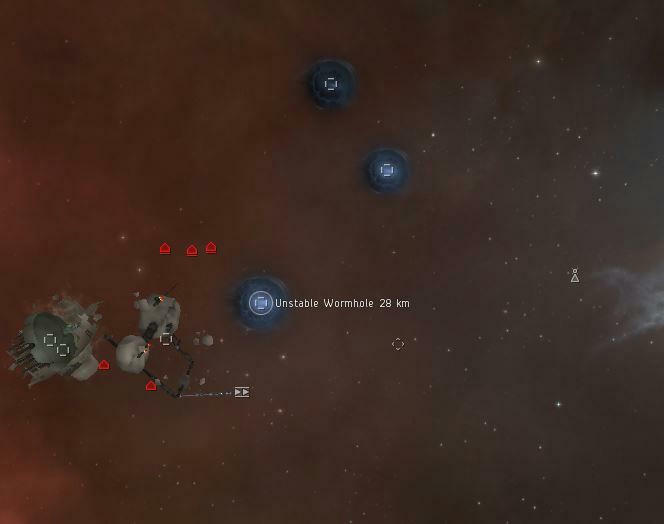 In the site there are three unstable wormholes in the first zone after using the acceleration gate. They all pulse separate of each other suggesting that they are not linked to the same system or wormhole generator as the pulse would be same due to the energy grid of the wormhole generator pulsing in time to keep one open. These wormholes are nothing like the normal wormholes that are encountered in New Eden. But if you look closely enough when the wormhole cycles you can see a region of space on the side of the wormhole. 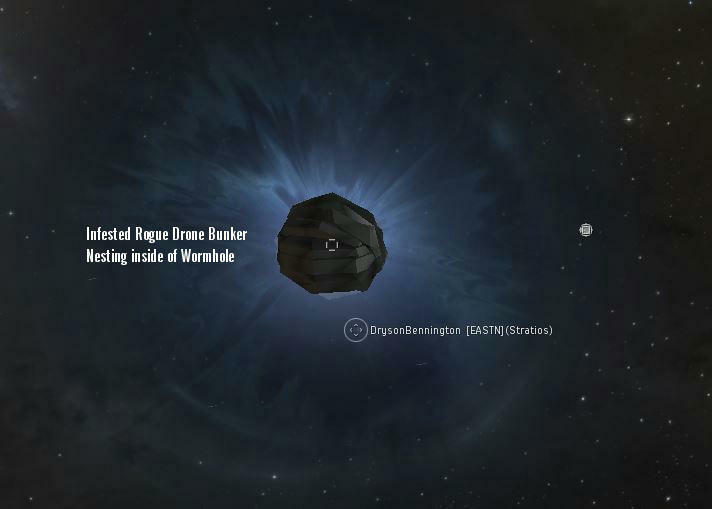 The third wormhole had an bunker infested with Rogue Drones nesting in the center of the wormhole. What is the bunker doing in the center of the wormhole? How can the bunker not be pulled into the wormhole? Or are the drones inside the bunker generating the wormhole and communicating with the Sleepers and Drifters? After I run this first zone I will investigate the nested bunker and attempt to attack and destroy it. The first mission to the Hierarchy failed as a result of a Strain Infestor Alvi warp scrambling and webbing my Proteus. Drone reinforcements arrived and thinking that I could break the warp scramble I ejected. Upon boarding the Proteus I was still warp scrambled and webbed. Stratios Search and Rescue operation launched. Upon returning to Hierarchy site readings indicated that it had been breached by another Capsuleer. Proteus wreck and the first zone were clear of all Rogue Drones except for two wrecks. The fate of the crew of the Ormurinn langi? Uncertain. A wreath was laid at the site in their honor. A corporation named CA-VA was responsible for the zone being clear. Both wrecks were salvaged and research continued. The first image is of the Hierarchy site upon warp-in. The second image is of the three wormholes with annotations. The third image is of the wormhole with the Infested Rogue Drone Bunker nested in its opening. I did not take an image of the wormhole up close to show what appears to be a nebula on the other side. I tried taking a video of the wormhole but upon returning to the site that data along with the Ormurrin langi had been salvaged. Hopefully I will be able to find another Hierarchy site to get another video of the wormhole up close. I have been thinking about this question and can answer that time does not in fact ever stop. Time is the measurable distance between two particles where a reaction takes place between the two particles in a medium that reacts, causes a reaction or bounds a reaction taking place between particles where the distance of the medium can be measured as well as the distance of the particles traveling in the medium and then reacting as well. Therefore time does not stop. Time might slow to a relative standstill but some action of time is constantly taking place around the two particles creating a measurable distance. I was also thinking about particles that are consumed by a black hole. It is said that time stops inside of black hole. If particles are packets of light that are translated as data do stop after they cross the event horizon of a black hole then each time the packet of data or information is pulled into the black hole and stops it is occupying the same exact space inside of the black hole that it had occupied on the other side of the black hole before being pulled into the black hole. Thus recreating the object pulled into the black hole on the other side of the black hole possibly. I also think that a black hole functions much the same that the human eye functions in so much that light is seen by the eye and converted into data within the brain that humans then try and figure out what the object is. Light does not escape the 'black hole' of the human eye much the same it does not escape the event horizon of a black hole. In both cases visible light is recorded and analyzed by the brain and stored. So does a black hole store the light that it takes into its event horizon in the form of being new planets and solar systems that would be present on the fringe of another expanding Universe? Much like our Universe is expanding are there galaxies just on the other side of the edge of the Universe that come into being as their recorded data passes through the event horizon of a black hole and is reproduced for us to see in our Universe? "Do what you haven't done is the key, I think." - Ridley Scott. What has been discovered to be older than Earth itself by a few hundred millions years. How can the water on Earth be older than Earth when our planet first formed as a molten mass of hot and searing lava? The only explanation is that water was brought to Earth after it formed. Otherwise the water would have evaporated during the first hundred millions of years when Earth was forming. Withe water evaporating it would test to be younger than the planet. Brought from where and by whom is the question? The other possibility with water being older than Earth is that large field and clouds of particle ice were present after the Big Bang. These large fields of ice containing water and oxygen, much like a large field of trees, would covered vast areas of the Universe. Like a large inter-connected network microbes in the form of bacteria, viruses and proteins alike would have moved across the ice particle field coming into contact with each other creating new life and destroying each other. This could be the reason why humans are so bent on destroying each other for resources on the planet. It is a carry over from the fight in the ice particle fields and has become embedded in our memories as a passed on trait. Once planets began to form the particle ice fields collected into planetesimal fields that orbited planets with an EM field strong enough to protect life from the harmful radiation of a sun. As the planet cooled the ice fields in orbit around the planet collided with the planet and began to melt that ultimately allowed for the life caged in the frozen cell to use the liquid water to increase its rate of mass, reproduction and sentient ability. So not only is Earth teaming with life so would other planets in the Universe that have an EM field very similar, 95% similar, to our own. Running....just makes the pain take longer. Hiding....just makes the wait take longer. Screaming....You will never hear yourself scream again. You track it and make it run. You make it hide. You make it scream. You make it your b*tch....or you kill it. If the human DNA Protein Chain is passed on through reproduction then why is DNA present in a humans finger print that is more distinctive of the individual human unlike DNA? Did humans at one time reproduce using DNA stored in the fingerprints by submersing their fingers into a form of primordial glop that is able to read the DNA encoded sequence in the distinct finger print that the protein chain is then able to reconstruct the human DNA protein from? The appendix regulates numerous bodily functions such as blood pressure and temperatures. In order for a biological system to evolve more blood must pass through the blood vessels that allows the appendix to direct the growth of the brain. In order for a big bang to take place the area around the initial point of the expansion must increase in size like the blood vessel to allow for more matter to flow that increases the area in which the brain and consciousness can expand into sentient though. So there is a process that does in fact regulate the Big Bang just like the appendix regulates blood pressure. Our Universe is basically the same as a blood vessel that the more it expands the more matter or blood cells pass through the blood vessel. More blood means larger muscles are able to form as well as more stable standing and walking foundations for bones. Think of Universe as a flat hose slowly filling with water. At one end is the Big Bang and the end is a Black Hole that create a pinch point. From a black hole our Universe came from. If you stack the pinch points on top of each other they create a glass hour glass form as well as the twisting shape of DNA. A process has to be present near the Big Bang that regulated the initial pressure and temperature that created the Big Bang. Is the Universe a biological homeostatic mechanism or is it a metallic homeostatic mechanism. If atoms are able to move dust particles in water and dust particles are mostly skin cells with human, plant and animal DNA encoded in the dust particle is the atom able to transfer the genetic coding sequence of the protein make up contained in the skin cell to form a new genetic sequence? If finger and toe prints are unique identifiers for each human could the finger and toe print when encountered by an atom transfer the sequence to other matching protein sequences to create new protein characteristics? If human skin cells more precisely the finger and toe print skin cells make it into space and are bound to specific atoms could the atoms carry our DNA characteristics across the Universe to other habitable worlds to create new life that our DNA proteins encounters and vice versus? An electrical charge generates heat which causes molecules to expand. When biological systems expand allowing more blood and water to pass through a vessel the more work and sentient abilities are achieved. If Atoms and skin cells containing the finger print protein chain sequence code are aligned similar to how Ice - 7 is aligned under great pressure would the protein chain merge into a genetic code sequence based on how the energy is transferred over the finger print that would be a unique electrical frequency modulation of sorts that would align the proteins in a chain to create human being? How does General Relativity curve the association of atoms transferring Protein data between atoms and other dust particles to form the human finger? What is the point of equilibrium? From the ashes of the old comes the life of the new? Based on thousands of years of study which much be as boring as watching paint dry, watching atoms push a dust particle probably comes in a close second. But then you begin to think about the common cold virus that has still not yet been conquered. Dust is many particles that is made up of human, animal and plant skin that flakes off as new skin is created. The shedding of the skin releases trillions upon trillions of particles that contain the protein sequences of the DNA or the building blocks up life. If a virus which feeds on biological life and cells would happen to come across a dust particle that contains the protein sequence for human life found in the finger print of a human that is being pushed by an atom or two or three atoms, would a transfer of data take place? Would a data transfer take place allowing the virus to use the protein it finds in the finger print skin particle as a source of nutrients? A source of nutrients, that as the energy wavelengths of the atoms pass across and into the ridges of the finger print pattern and then back up to create an algorithm, would transfer advance DNA construction sequences to the virus itself that would allow the virus to survive better with its new DNA sequence chain that it has borrowed from the human traits found int the protein chain. Once the new protein sequence had been incorporated into the virus would the virus begin to develop new organs in its body based off of the human DNA data transfer? If the virus encounters the protein sequence that directs how the brain is formed, would the virus develop its own brain on its way to sentience? Would the virus become a new form of humanity that would look to seek its "God" out? So that is what Space Time looks like? Is there a more detailed image of the Space Time mainframe for our solar system? Would each solar system have its own Unique Space Time Signature? How can our solar systems space time signature be used to determine if another solar systems space time mainframe to be similar to ours that would suggest life might present in the virigin solar system? Earth creates it own unique space time signature based on the article above. A planet with life on it in another solar system would also have a similar space time mainframe signature as well. Each solar system would also have its own unique identifier as well. With each solar system having its own unique identifier signature to it like the DNA of the human protein chain there would be a link to each unique identifier that would have a series of like characteristic traits in the chain that when matched up with the Earth identifier chain could lead to the discovery of more Earth like planets. The physiology of each unique identifier would determine how each systems physical appearance looks where no two systems like humans would be exactly the same. The abillity of such a chain sequence would eventually lead to the identifier of a habitable world. TWINS...twin redheads, twin blondes, twin auburn and twin darkheads...oh my!. I read the article but was more interested with the eyes of the Lizard Fish. Let me take you back in time for a moment when the Earth was young and water was not as prevalent.
" Begin descent...start scans...all probe lights on...lets lift her skirt and see what she has." The Mariana Trench is filled with water and is a hot springs of activity as the first life begins to emerge. Then looking up 36,070 ft off in the distance we see the shorelines of Japan, China, the Philippines and Papaa New Guinea. The lush vegetation crawls over the landscape and up the sides of the indomitable heights above. Water falls cascade from the rocky heavens above showering the jungle below in a constant unending deluge of rain and mist. The jungle below warm covered in mist and deadly. At one time the Earth would not have had water on it but would have filled up slowly over time as more and more comets impacted Earth. Looking up nearly seven miles, the number six (8) being perfect in creation, like a woman (3)+ a seven day week (7) = 13 or 1 +3 = 4 and 3 x 3 which equals 6.831439 the actual height to the rocky heavens above. Seven miles above there are small pools of water 20 to 30 feet in depth full of life made by comet impacts. More and more comets fell from the sky carving great lakes in the Rocky Heavens above and filled with water more than the rest of the Earth at this time. As the lower lying lands of the Rocky Heavens gave way to more water the waterfalls gave way to rivers running down the mountain sides into the valley's seven miles below. Life from the heavens soon found its way into the forest of the below. Eventually the great bowl filled with water. If the Earth had not been this way at one time then fish species such as the Lizard Fish would not have needed eyes but would have evolved to sense the heart beat of prey around it as well as the heartbeat of a mate. Since most if not all species of life on Earth have eyes then life evolved on Earth at time when water was present but not Mariana Trench deep yet. I would even have to say that early civilizations ventured down the side of the heavens into the mist below where they built mountain side entrances to great caves to live in. Go paint a landscape, dream a new dream of what I have shown you and take the challenge of the heights to find life in the Universe as life that does not see the light will still know the heart beat of life. If light cannot escape a black hole and is stretched to infinity then as the light photon passes into the black hole it is stretched to a point of infinity that occupies the vector that it was pulled into the black hole. Infinity would be a factor of its own gravitational influence upon all things including light and a black hole. Infinity is a wave that propagates time itself. Time is a measurable distance between two points that is based on how infinity stretches light itself. If you were to measure the length that a single photon travels in its life time and then factor in all of the distances that all light from a sun radiates during it's life time and then lay that distance end to end and then factor all of the distances of each photon emitted from each sun and lay those end to end then you have the rate at which Infinity occupies space. Therefore when a light photon is pulled into a black hole the factor at which time functions inside of a black hole is a some of all of the light photons that it would consume from the available universe around it. The more suns that are in the presence of a black hole would equal a faster rate of infinite time expanding within the black hole itself. The initial sun that collapsed into the black hole would generate a rate of expansion in space inside of the black hole based on the initial theorem of the collapsing sun radiating all of its photons at once that would create a Universe inside of the black hole that would constantly expand based on the matter the black hole consumed. As long as the black hole is consuming light the Universe inside of it will continue to expand and remain stable. The Tesseract is much like a dream, its a connection. No matter how many people you meet in your life you will always be connected to those people even if you don't know them or have every interacted with them. Infinity propagates the Universe through the Tesseract the same way that a dream functions. A dream takes bits and pieces of your daily interactions and combines them with other stored bits from other dreams to generate a new reality to guide you through your sleep or the darkness of infinity itself. Light connects to all points across the Universe at all times These connections are then stretched to a point of singularity within the black hole and then expand into infinity again. Once you meet someone that connection will remain connected to for all time, no matter how far you travel no matter the distance traveled that connection will remain and exists at the point of infinity. You have to know which light beam to push on and in what order to get them to see their whole destiny as humans. Humans are meant to seed the Universe and as many planets as possible.